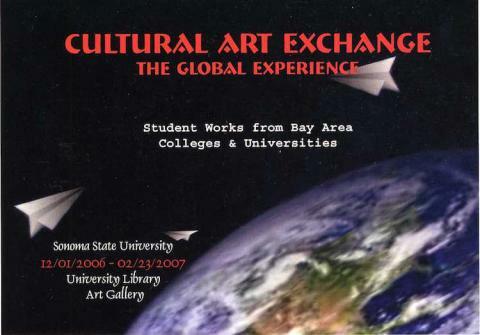 The University Library Art Gallery presents the exhibition Cultural Art Exchange: The Global Experience. The exhibition was organized by students enrolled in the Gallery and Museum Methods class under the direction of Professor Michael Schwager. Cultural Art Exchange: The Global Experience presents the work of 11 student artists from around the world who have traveled to Bay Area Colleges and universities for the purpose of studying art. The goal of the exhibition is to provide a forum of exploration on the effects of international travel and cultural exchange on artists and their work.